Rock-salt, or Halite, Mine Rock Salt. Named rock-salt and mineral, and the rock built by him. Chloride of natrium sodium. Glance (glitter, glare) glassy, fatty. Transparent. Colors: white, grey, rather yellow, dark blue, red; often colourless. A line is white. Fracture, break padman. Cleavage perfect absolute. Taste is salt. Paints flame in yellow, gold color. Appears mainly in siltages. Crystals (cube Crystal structure) have a form of cube. Quite often forms continuous dense the masses. Deposit minefield mine field occurrence subsoil: Stasfurt (Germany), Lower Saxony, Bavaria (Germany), Tyrol (Austria), Italy, Spain, CIS, USA. Crystallized usually as a cube. On the verges of crystals often there is characteristic distortion as deepenings which name "square craters". Such phenomenon is a certificate of very hasty and uneven growth of crystal, because on ribs a matter is deposited much quick, than on the plane of verges. Halite, Mine Rock Salt can be also massive or grainy. Culinary salt - typically allochroic mineral. It can acquire the most different colouring - from colourless to almost black from the bituminiferous including; sometimes reddish, red or grey-red due to including of shallow dendrites, anhydroferrite or hydroxides of iron. 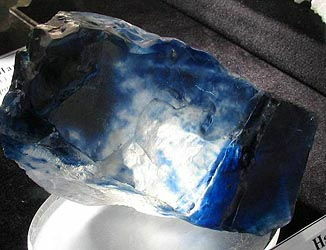 Often it can have a blue color, up-diffused unevenly on volume crystal, that, possibly, it is related to the displays of natural radio-activity. Look like glass, transparent and translucent, salt is a soft, easy and fragile mineral. It possesses perfect cleavage on a cube. A colourless or white mineral sometimes tinted by impurities, found in beds as an evaporite. It is used to produce common salt and chlorine. Composition: natrium sodium chloride. Formula: NaCl. Crystal structure: cubic. Also names called: rock salt. Chemical composition (chemistry, compound). Natrium sodium (Na) 39,4%, chlorine (Sl) 60,6%. Form of crystals. 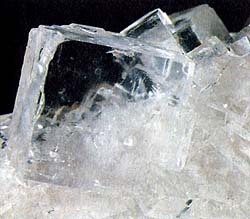 Cube crystals, often grainy or spar-like aggregates (rock-salt). Crystalline structure. Typical ionic building. Granecentrirovannaya cube lattice: the ions of natrium sodium (Na+) and ions of chlorine (Sl-), alternating in a crystalline lattice, are disposed on the corners of small cubes (sm of tablas. 1). Class of symmetry. Hexaoctahedral - m3m. Cleavage. Very perfect absolute on a cube; mineral cleave in three directions; differs fluidity. Aggregates. Grainy or dense the masses (rock-salt). A main feature of culinary salt is ability to dissolve in water. Pleasant salt taste, incomparable with bitter taste which is given by salts of potassium and magnesium, has its solution. Fuse melt, painting flame in yellow, gold color. In water dissolves easily, has a pleasant salt taste, what differs from very alike sylvite (KCl), also easily dissolving in water, but having a caustic taste. It is impossible to mix up with poisonously-radio-active celestine !! 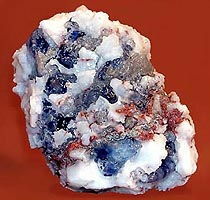 Sylvite a soluble colourless, white, or coloured mineral consisting of potassium chloride in cubic crystalline form with sodium impurities: it occurs chiefly in sedimentary beds and is an important ore of potassium. Formula: KCl. Although in itself "Halite, Mine Rock Salt (white salt) in a clean kind" a people needs, his illiterate reception in food can result in poisonings, illnesses and even death. 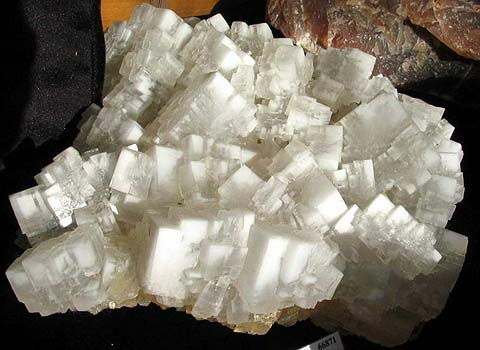 There are chemical admixtures of two types in Halite - superficial, which can be washed off or neatly scrape, and up-diffused in the layer of crystals. Before any chemical analysis of salt all of Halite, Mine Rock Salt - especially blue and dark blue - passes primary (!!) strict verification on a regular dosimeter without exceptions. It guarantees against a production traumatism, caused a radiation. Physical characteristics of dark blue and blue halites. 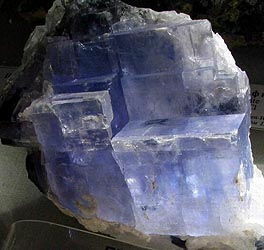 This mineral can contain the radio-active components of dark blue and blue color (norm of natural radiation - 17-24 milliroentgen/hour). By the enhanceable level of radiation of stone and minerals is level of radiation from 29-32 milliroentgen/hour and higher. On the right is a sign of potential radiation danger (Ukraine, CIS, K.305). Radio-active stone and minerals at the protracted carrying on a neck can cause the radiation damage of thyroid gland and cause its changes (including oncologic). Analogical local damages can be caused the protracted carrying of dangerous minerals directly on a breast or in the pockets of masculine pantaloons. From the high background of radiation these dangerous for a health minerals are chosen by men, anchorwomen solitary way of life - and it is harmed this the health and surroundings (behavior the unhealthy way of life). Safely to carry minerals with the low level of radiation without depending on their kind on hands (in rings and bracelet, bangle-"wristlet") and on feet - as possible farther from a thyroid, birth-marks, large birth-marks (especially protuberant), from a breast, superficial lymphatic knots etc. the objects easily struck a radiation on the body of people. 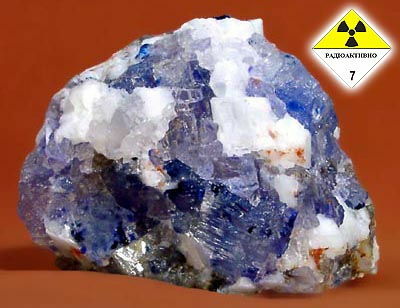 In any case from considering of safety and ecofriendlyness it is not recommended to carry poisonous and potentially radioactive stone and minerals constantly and to hold the large standards of such minerals in an apartment or working cabinet (a house and apartment is a not mineralogical museum with the possible level of radiation from 32 to 120 milliroentgen/hour and higher for special exposition and mineralogical special safe, storage, depository, depot, storehouse, repository state institutions). A radiation from a point source and object decreases proportionally to the square of distance to this object. Stepping back on 2 meters from a dangerous object, you will decrease the level of study from this object in 4 times. Stepping back on 10 meters, you will decrease the level of radiation of this object in 100 times. If a point radiant has an object 2000 milliroentgen/hour at the natural background of radiation of environment 19 milliroentgen/hour (totally 2000 + 19 = 2019 milliroentgen/hour), stepping back from a dangerous object on 10 meters, you will secure itself to the level of radiation 20 milliroentgen/hour from an object and 19 milliroentgen/hour from an environment (total the general level of radiation from an object and environment will appear already 20 + 19 = 39 milliroentgen/hour). Dangerous is a direct contact with a body and carrying on the body of point and diffuse sources of radiation and radio-active components (an about 50% radiation is taken in at a contact with the external surface of body and an about 100% radiation - at a reception into a radio-active or infected object). 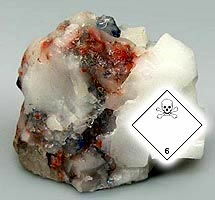 Most dangerous is a direct reception into radio-active components, stone and minerals, including pounded in powder and especially soluble in a liquid. All of wilful injections of radio-active preparations are categorically forbidden. It not sapphire !! Unlike natural sapphire, not water-soluble, dark blue and blue halites easily dissolve and lose weight (their sale is a swindle) !!! 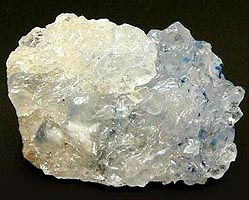 Halite, Mine Rock Salt - soluble mineral. You will memorize, it is important - if chemical admixtures are up-diffused inwardly salts and form with it unseparated friend of го friend constituents, such salt (Halite, Mine Rock Salt) painted in-bulk is not used in food not under what circumstances. The "coloured" salt is not subject any mechanical and to the chemical cleaning with the purpose of its subsequent eating up living creatures and examined exceptionally however much industrial and production raw material for unfood industry (even cleared from the coloured admixtures !!) is a not meal and not fertilizer. Dark blue Halite, Mine Rock Salt, almost ideal imitation of Sapphire (dissolves). Specific red compounds allow to suspect in these mineral aggregates salts red Cinnabar, Vermilion, Spanish Red - the most poisonous salt of mercury. On pictures the uneatable standards of halite (NaCl) are higher resulted scienter with the most dangerous minerals. So admixtures look to Halite of not only dark blue of salt but also most dangerous poisonous soluble salt of mercury - red cinnabar, favourite stone of "black stone litotherapeutics" (especially from Western Europe and Spain, where the largest deposits of red cinnabar are exposed - the lacustrine is especially dangerous stratal Cinnabar, Vermilion, Spanish Red with the opened outputs to the drinkable reservoirs), which very successfully grows not only on Quartz and other containing rocks and penetrates into these rocks but also on the aggregates of white culinary salt - halite (NaCl). On pictures the uneatable standards of halite (NaCl) are resulted scienter with the most dangerous minerals - blue, dark blue and red FOREIGN inclusion. Be found in the basic sediments deposits of the most different age, appearing as a result of evaporation of salt water in the reserved pools. Similar formations are various on scales and sometimes are very considerable. In the two-bits of Halite, Mine Rock Salt can appear as a result of the direct besieging at the sublimation of volcanic steams and gases. Halite, Mine Rock Salt. Artemovsk, Donbass, Ukraine. A photo: © A.A. Evseev. The deposits of culinary salt of Volterra (Piza) are known in Italy, and also and in many places of area Sicily, mainly in the provinces of Agrizhento (Rakalmuto) and Enna (Kalachibetta). The enormous deposits of crystalline halite (NaCl) are developed in Stassfurte (Saxony); near-by Zalcburga (Austria); in Velichke (Poland). Deposit minefield mine field occurrence subsoil him known in Switzerland (Beke, Canton In), France (Lorena) and Spain (Kataloniya). Besides European, base are the American saliferous pools in the states Louisiana, Kansas, Arizona and California. In addition, there are deposits in Peru and Argentina and the largest - to Ukraine (CIS). "ARTEMSOL" ("Bahmute" dietary salt) is a production amalgamation on the booty of salt in the Donetsk region of Ukraine (CIS). It is formed in 1976 6 mines (mine of N 1 - the eldest, exploited with 1898) and other processing enterprises include on-the-road. Basic industrial and administrative center - Soledar of Armemovsk of the Donetsk region, Ukraine (Europe), CIS. "Artemsol" develops the Artemovsk deposit the saliferous layer of which is timed to the Permian formation deposits and counts 19 layers total power a to 180 m, by the angle of incidence of 2-5. The best white salt in the world. Industrial layers - Nadbryancevskiy, Bryancevskiy and Podbryancevskiy by power 29-40 m. Table of contents of Industrial halite (NaCl) of NaCl - 97,7%-98,7%, insoluble remain of 0,2%-0,5% (0,7% - very low), coefficient of hardness of salt - 2. Tectonics of deposit - relatively quiet, there are outputs of native chlorine (very dangerous toxic gas, burns of lights, trachea and larynx), hydro-geologic terms for underground works relatively favourable (water is). A middle depth of development is 260 m (maximal are 320 m, to 400 mcode - on the type of Fergana mine of red cinnabar of "Khaydarkan" in Kirghizia, Middle Asia, CIS), the layers of minerals are unsealed vertical barrels (industrial beddings - on the type of the native bedding of stratal industrial red cinnabar in Almaden , Spain, European continent, west of EU). Prevailing system of development - vestibule (horizontal layers of halite (NaCl)) with abandonment of interchamber spurns on extending. Chambers breadthways 17 m, in 25-36 m (depending on power of layers) high, long 1500-1800 m. The preparatory making (overhead and lower hacking of chambers and transport drifts) pass the helldrivers of type "Ural-20 KC" and "4PP-2"; on works in a mine apply the blast-hole drilling method of breaking, wire-rope-chain and disk saws. Loading of salt - by power-shovels and dirt loader, mucker, mucking machines. Underground transport of the horizontal driving - conveyer; used lorry convoy and self-propelled electric carriages (a backwall looks like underground passage Kharkov, item of the "Historical museum", Saltovskaya line). Power of mines is 780-2300 thousand t in a year. 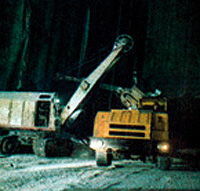 Average daily loading on a cleansing backwall - 1500 t, average monthly labour on the booty of salt productivity - 684-1200 t (1981). Salt is processed on special salt-factory manufactory - ground down crushers and roll, rolling mills. A product is packed in packs for 1,5 kg (1 litre) for a sale a population and in B/Ss weighing for 50-75 kg for supplying to the enterprises food and other (foodstuffs) industries. To the rural-economic enterprises and in huntings economies salt is sent as blocks (2-40 kg - for feeding of animals) and preforms with mineral additions (5-10 kg), including for feeding of finfishess in especially fresh waters (Udy, right influx Severskiy Donec, Chuguev, Kharkov region, Ukraine (Europe), CIS) and artificial-desalinated, including the distilled waters (aquariums, oceanarium, pools for maintenance of coral and other nabs). A chloride of natrium sodium which is extracted from salt waters and obtain at development of deposits of culinary salt is an irreplaceable component of feed for a people. In chemical industry used for the receipt preparation of such matters, as a drinkable soda, caustic soda and muriatic acid. Halite, Mine Rock Salt. Kalush, Prikarpat'e, Ukraine, CIS. A photo: © A.A. Evseev. 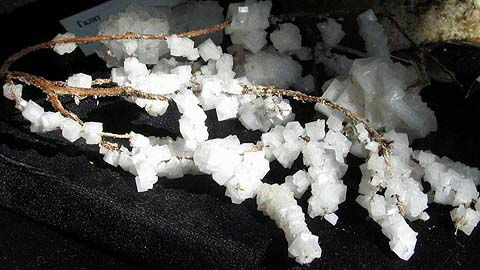 Halite, Mine Rock Salt, growing on a branch. Oz. Saki, Crimea, Ukraine, CIS. A photo: © A.A. Evseev. Risk of fire and explosion at a contact with water. Natrium sodium is a vitally important intercellular and intracellular element which in the organism of people participates in creation of necessary buffer of blood, adjusting of piesis, water exchange (the ions of natrium sodium are instrumental in swelling of colloids of tissues, staying water in an organism, and instrumental in its accumulation), activation of digestive enzymes, feed of nervous and musculartissue. Accumulating water in an organism, hinders dehydration (at insufficiency of water of cage stop to execute the functions, and slags accumulate in an organism). It is needed for a cardiac muscle. Signs of insufficiency of natrium sodium: spasms of muscles of stomach, absence of appetite (anorexia), nausea, vomiting, loss of orientation, hypotaxia motions, dehydration, depression, dizziness, fatigueability, hallucinations, head pain, cardiopalmus, mionectic threshold of the taste feelings, somnolence, lowered arteriotony, weakening of memory, muscular weakness, repetitive infections, loss of weight. Surplus of natrium sodium results in development of high blood pressure and surplus of water in an organism. The overconsumption of natrium sodium is overloaded by a heart and buds (at formation of urine they process blood with enhanceable maintenance of natrium sodium), feet and person swell up. At the diseases of buds and heart it is recommended to limit the consumption of culinary salt. Toxicness of chloride of natrium sodium for a people, set on a minimum lethal (mortal) dose, makes 8,2 g/kg of weight at peroral introduction (through a mouth and gastrointestinal tract). The mechanism of toxic action in the places of introduction is conditioned a high osmolality. As a result the intensive receipt preparation of water takes a place from surrounding tissues, that results in their dehydration and violation of functions of cages. Inflammation, resulting in necrosis of tissues, develops in the epithelium of gastroenteric highway and kidney tubulis. Permanent surplus of natrium sodium and potassium is accompanied the increase of level of insulin in blood. Other hormonal violations are marked. Introduction of plenty of chlorous natrium sodium is caused by disintegration of albumens and weight loss, malnutrition. The temperature of body can rise at parenterally introduction of isotonic solution, that is observed for children. People in plenty of natrium sodium are excitable, vulnerable, hyperactivity, thirst and sweating appear for them, frequency of urinations is increased. Basic displays of surplus of natrium sodium are a fatigue, excitation; neuroses; disfunction of adrenal gland, parafunction buds; formation of stone is in buds; thirst, edemata; hypertension, hypertensia, osteoporosis. Natrium sodium is needed: at hard physical work, high external temperature, abundant perspiration (the norm of consumption of natrium sodium is increased almost in 2 times), employments by sport in hot days or in the conditions of hot climate, to work in hot workshops, at vomiting, diarrhoeas, and also at the use of food, rich in potassium (natrium sodium is an antagonist of potassium). A basic source of natrium sodium is culinary salt. To the people in the day of necessary 5-7 g of culinary salt. However actually we consume it anymore, as salt is contained both in meat and in fish, and in green-stuffs. For acceptance of mineral and medical baths it is possible to use marine salt, as it contains other microelement. A chlorine, the same as and natrium sodium, is the element of culinary salt of halite (NaCl) and vitally important for the organism of people. It one of basic elements of water-salt exchange of living organisms (food - in gastrointestinal tract). Surplus of chlorine, as well as accumulation of products of his co-operation, with other matters can be reason of increase of risk of cardiovascular diseases, allergic reactions and abortions for miscarriage mothers. 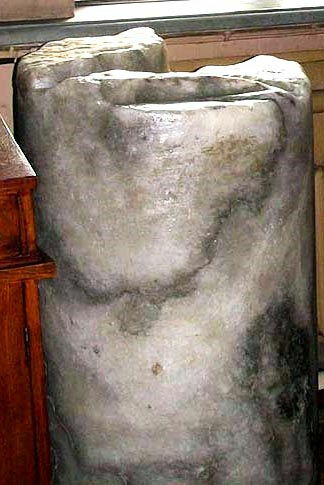 Researches show that with the consumption of chlorine the increase of urinary bladder and origin of shrine is in water. A chlorine and his compounds is very toxic (it toxin). A basic display of surplus of chlorine is oppressing of growth. A free chlorine in water oxidizes and kills microorganisms, however much he also co-operates with other matters, forming poisonous compounds. A chlorine is synergist of natrium sodium. Children which use the closed chlorinated pool for employments swimming can more feel like development of asthma - a chlorine is used in pools for water treatment. The by-products of chlorinating contaminate air in the apartment of pool, irritating respiratory tracts and lights, doing them more vulnerable to the allergens. A chlorine is sucked in, mainly, in a thick intestine. Effect of water sulphureous sources and inhalation sulphur, brimstone. In the organism of human people (mass of body is 70 kg) contained 95 g of chlorine. An about 85% chlorine is in extracellular space. 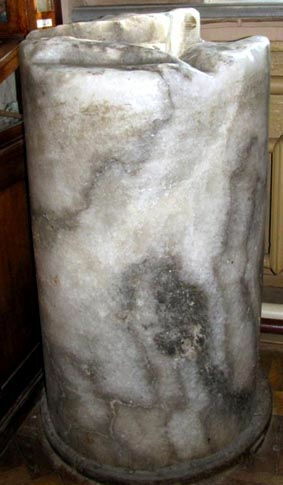 Myshechnaya tissues of people contains 0,20-0,52% chlorine; bone - 0,09%; plasma of blood - 0,35%. A chlorine accumulates in visceral tissues, skin and skeletal muscles. In the glands of stomach (gastrointestinal tract) and skeleton of people maintenance of chlorine in three times is higher, than in other organs and tissues. A chlorine hatches from an organism with urine (90-95%), by an excrement (4-8%) and through a skin (to 2%). The ions of chlorine participate in maintenance of osmotic equilibrium, chlorides-ion has an optimum radius for penetration through the membrane of cages. This is explain his joint participation with the ions of natrium sodium and potassium in creation of permanent (chemical) osmolality and adjusting of water-salt exchange. The ions of chlorine render a braking effect on neurons by the decline of potential of action (not metal). The chloric ductings are presented in many types of cages, mitochondrial membranes and skeletal muscles. These ductings are executed by functions in adjusting of volume of liquid, transepithelial transport of ions and stabilizing of diaphragm potentials, participate in maintenance of рН (acid level) cages. In a stomach the ions of chlorine create an environment for the action of proteolytic enzymes of gastric juice, it is component part of muriatic acid, produced a stomach, necessary for mastering of food products. A chlorine is important for forming of plasma of blood, is the activator of enzymes, plays a substantial role in maintenance of acid balance of blood. It participates in all of biochemical reactions which take a place with participation of natrium sodium. A chlorine plays an important role in an organism, supporting normal balance of liquids. The deficit of chlorine can arise up at the diseases of stomach and duodenum, which maintenance of chlorine diminishes at. Also insufficiency of chlorine can arise up at the observance of salt-free diet, which is appointed at high blood pressure, diseases of buds and other illnesses. Signs of insufficiency of chlorine: loss of the taste feelings and appetite, nausea, languor, muscular weakness. Wrong often, considering that at the consumption of the recommended norm of natrium sodium the norm of chlorine is automatically consumed - far there is a chlorine not in all of minerals and salts of natrium sodium. A chloride of natrium sodium is culinary salt (Halite, Mine Rock Salt). There are other chlorides. Food sources of chlorine. With food a chlorine acts usually as a chloride of natrium sodium and chloride of potassium. Especially rich in a chlorine bread (he is additionally salted Halite), meat and sucklings products, from vegetable products is a black radish, laminaria (oarweed).